Air Temp: 68F at trip’s start with occasional light drizzle. Wind: Winds were ESE at ~10 at (obscured) sunrise, slowly increasing to ~17 and steady, and slowly turning into the SSW. Skies: Skies were entirely clouded grey the entire trip — darker in the AM and brightening in the PM. I launched this morning and spent a lot of time very slowly motored my way downlake just very closely watching the surface for schools of shad and/or white bass lightly feeding on topwater. In the vicinity of Area 159 I noted abundant carp activity. These fish were near the surface and were rolling and surfacing regularly. I also noted a few carp up on the shoreline here as well. Amid the carp activity, I noted occasional, single white bass sipping shad off the surface over open water more distant from the shore. I caught one on a cork rig before moving on to continue the search. I headed to the shallows between Areas 026 and 222 and again slowly motored while watching my surroundings and sonar. I saw some bottom hugging fish in 16′ in this area and got a slab down among them without result. I then headed to between Areas 160-205 and felt blessed to find abundant white bass surface feeding activity here at around 8:00am. I again went with the cork rig, got 2 whites and missed a nice largemouth right off the bat, but then continued sight casting to surface feeding fish without result. What I found was a repeat of a situation I encountered around this time last year. These white bass were feeding at the surface on shad fry. These fry are extremely small and don’t require a lot of effort to track down, catch, and consume; accordingly, the white bass were not in the classic topwater frenzy, rather, they were feeding in a more relax, slow, easy manner just slurping these small fry in. Since the size of these fry make them essentially impossible to imitate, I experimented with an alternate presentation that would tempt them. I found that very accurately placing the cork rig on feeding fish and then non-aggressively working that back to the boat, thus NOT creating a bunch of commotion allowed for a fish to be caught on nearly every well-placed cast. When the fish disappeared from the surface, a bladebait failed to produce, despite the fact that I could see and keep up with the moving schools after they sounded. I stayed on these fish for 2 hours as they surfaced and disappeared, surfaced and disappeared. By around 10, this action died. I’d taken 31 fish here by this time. Often when the fish are found at Area 205, they’ll also begin showing up in other predictable places, as well. I headed to the cove in which Area 431 is located and slowly motored, looked, and studied sonar. I didn’t see much going on, but wanted to linger just in case, so I worked a jigwork along the rocks listening and watching. The wind was still SE at this point, leaving the area fairly calm. I looked back in the backwaters and pockets to see if any sunfish had pushed up shallow yet, but saw none. I managed 3 average largemouth on the worm with 2 more missed on the jump, but no signs of white bass materialized, so I moved on. I then headed to Area 245. The wind was beginning to go SSE and was picking up at this point to about 14-15. I noted regularly appearing schools of shad tightly grouped on bottom, indicating they were defensive. I saw a few gamefish arcs on sonar and so dropped a buoy on the best-looking spot on the spot and went to work. At first, it was like pulling teeth, getting a few small largemouth to perk up, chase and respond to and easing technique. Then, a few white bass entered into the mix, primarily moving through suspended in the bottom 1/3 of the water column. As the action peaked (although still very sluggish) I was catching a mix of whites and black with regularity and also pulled a short crappie and 2 drum. A total of 14 fish came off this area before the action died hard. I was about to call it a day and was actually packing up the gear and prepping the boat to head back in to the ramp, when very suddenly the wind shifted from SSE to SSW and racheted up about 2-3 mph. A wind shift out of the west is always a fish trigger. I headed down to Area 430 and one quick sonar pass revealed very active fish near and on bottom in ~24-27′. I got positioned over these fish, got a slab down and they immediately started pounding the slab, despite the fairly silty, olive-drab water. In the next ninety minutes I added 33 fish to the tally. This congregation of fish included a number of year groups from 1-4 years, ranging from 7 to 15 inches in length. By around 3:15p this action was tailing off, so I packed it up for good. For the 24 hour period of this day, the lake rose 0.12 feet and is still ~1.6 feet below full pool. 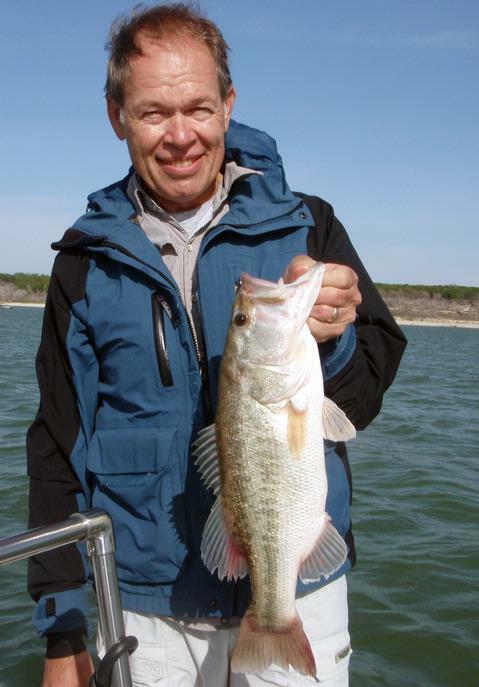 April followed its typical pattern seeing the last white bass head up the tributaries as the majority of the fish headed back and hit the main lake areas hungry. We began to see the first bit of topwater as a result. The big news toward the end of the month was a massive slug of water coming into the lakes from heavy rains to the NW in the Leon and Adamsville areas. These rains really chewed up the water and brought an end to the very consistent fishing in the MacGregor Park area at Belton and the Cedar Gap area at Stillhouse. The rise of water timed very well with the threadfin shad spawn on both lakes and will insure a good bunch of forage for the year to come. 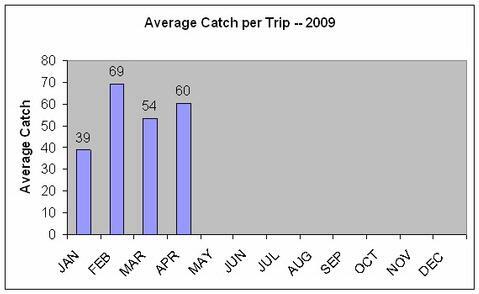 As the graphs show, we boated 784 fish across 13 trips, thus averaging 60 fish per trip. Fished a very short 1.5 hour trip this evening just to see if I could keep up with the fish movement with the massive load of water that came into the lake today. As the graph below shows, we had a rapid 3 foot rise in elevation between 2am and 2pm today, with the water still continuing to rise but at a slower rate after that. There are massive rafts of dead timber in the Lampasas River, in the river mouth, and near and beyond the FM2484 bridge. The debris field tapers off nearly the new water plant construction to the W. of Union Grove. The water is opaque brown from the river to the Union Grove dog-leg turn. Air Temp: 74F at trip’s start with occasional light drizzle. Skies: Skies were entirely clouded grey the entire trip with some spitting drizzle. I got out just before (obscured) sunset today mainly just to see how the water conditons looked, where the turbid water had extended to, and where the debris field had drifted to. Once I satisfied my curiosity, I ran sonar on some areas that typically hold fish a little later into May and early June, knowing that the whites were going to be forced out of that dirty water uplake. I was pleasantly surprised to find a strong school of whites settled in at Area 429. As I worked this area over, terns and Bonaparte gulls began to feed in and around this area in the fairly choppy water. Looking closely, I could see small packs of 3-4 white bass driving threadfin shad of ~2.5″ in length to the surface. I switched from my traditional 3/8 oz. TNT 180 slab to the 3/4 oz. TNT 180 and worked these fish over for the short span of time I had from finding them until dark. Because this was over 23-25′, the action rose off the bottom as light diminished. By trip’s end, I was throughing a bright bladebait just subsurface and reeling slowly for the last 3 of the 25 fish I landed tonight. My catch at this one location included 24 white bass, all 11-12 inches, and a single, pale, largemouth going right at 17 inches. For the 24 hour period of this day, the lake rose 3.45 feet and is still ~2.05 feet below full pool. Fished a very short 2 hour trip this evening after looking at the NOAA weather website and seeing the heavy rains that fell today in the Lampasas River watershed. I expect the lake will rise significantly, but don’t know about water clarity, so I wanted to see exactly where the fish were in their downlake movement following spawning so I could know where to pick up the search after the floodwaters reach us. Air Temp: 72F at trip’s start with occasional light drizzle. After a real nice visit with (always helpful) Chuck Guthrie over at Tightlines to look over and update the software on my new Humminbird Side Imaging Sonar unit, I was driving home along the Lampasas River and noted that the winds were coming out of the W. on clearing skies after a day of rain and SE winds. I hoped to capitalize on the windshift and really quickly got the boat in the water and headed out. I encountered significant white bass activity as far downlake as Area 349. At this location, I began slabbing after seeing fish both on and just off of bottom on sonar. The fish were acting very quirky. They’d ignore my jigged slab time and time again, yet, once one hit and was hooked, 3-4 schoolmates would come off bottom with it and I could typically drop back down and pick off another fish from the still active pack. This happened 4-5 times and I wound up with 8 fish here and moved on. I headed to Area 418 and found some shallow fish in ~16 feet of water here. These fish were also behaving oddly — just as at the previous location. I picked up 4 more fish on the slab (3/8 oz. TNT 180) and then heard the first of what would be about 40 minutes worth of spotty topwater activity. From that point, I switched over to a bladebait and chased topwater schools of whites until they were done for good, adding just 10 fish to the tally due to the spread of the fish and small size of the schools encountered. I fished a half-day morning trip today with Danny M. and Tim L. of Georgetown. We caught a mixed bag today allowing for both quantity and quality. Air Temp: 62F at trip’s start. Wind: Winds were 15mph+ at sunrise, steadily increasing to ~22 with gusts higher, all from the SSW. Skies: Skies were fair the entire trip with just enough high thin clouds to take the edge off the sun’s intensity but not darken the sky to the point where topwater activity could be expected. When Danny and I first spoke he mentioned that most of his experience centered around the pursuit of largemouth bass, but that he wasn’t stuck on fishing for just that particular species, so, we targeted whites early (when they are most accomodating) and largemouth later in the morning (when they are still quite active) and were able to enjoy the best of both worlds. We began up shallow waiting for the rising sun to clear the cloud bank in the east before searching for the white bass. 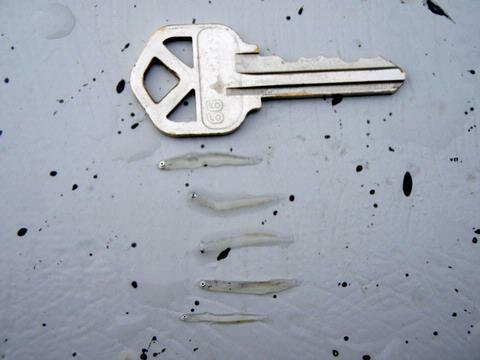 At Area 777 we boated our first fish on a jigworm — a short black of ~13″. At sunrise, we continued our trip well east of Area 55 and stayed there for 2 hours and 45 minutes catching fish consistently. The “normal curve” of activity played out today with the action ramping up, peaking, and falling flat over this span of time. We all used the TNT 180 in 3/8 oz. and caught 66 fish here including 7 largemouth bass, 1 drum, 1 crappie, and 57 white bass of all sizes ranging from 6 inches up to 15.25 inches, with most going right at 11.75, and all looking healthy — none had concave bellies nor looked in poor condition. We caught fish primarily with a standard jigging approach with occasional opportunities for smoking the slab, usually in conjunction with another hooked fish being reeled in. When the action here died, I set up with a downrigger to keep a lure in the water while I idled looking at sonar. Only Area 107 showed any promise, but did not produce. By around 10a we left the white bass in pursuit of largemouth. 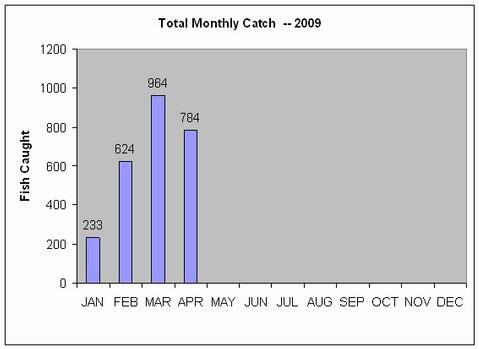 We hit a number of points including Areas 420, 421, 422, and 426 and caught fish at each one. These fish ranged from 12 to 16 inches, with one 3+ pound fish lost at boatside. These fish came on a variety of soft plastics, all in darker hues. These fish all came pretty much one at a time, and we had to work for each one. The wind made both boat control and line control a bit tough, and the fish were in a neutral mode. We saw very few fish of any sort chasing bait, very little bird activity, etc. In all, we boated a total of 7 largemouth while fishing the soft plastics specifically pursuing them. By 12:45 things were getting pretty slow and we called it a very good day. I fished today with Ben W. of Taylor, TX, and his brother-in-law, Jeff, who is on active duty with the Air Force in San Antonio. 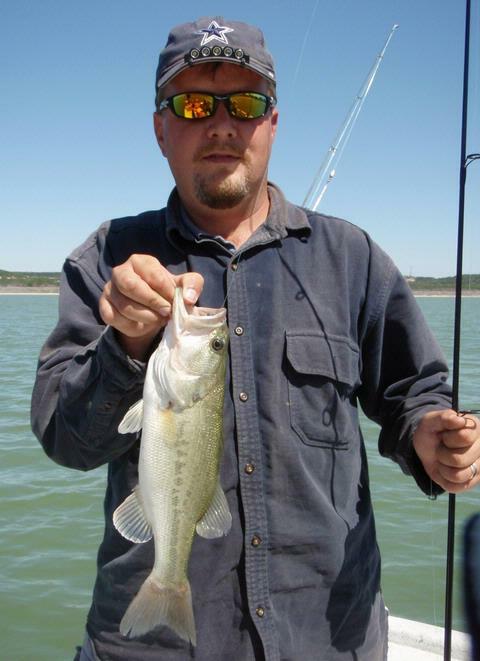 Ben contacted me about 3 weeks ago and was very anxious to learn about largemouth bass fishing with artificial lures. Up to this point he’d struggled to put all the pieces together and had mainly dead bait fished with closed-face equipment. Air Temp: 51F at trip’s start. Wind: Winds were variable in speed from NW to NNW at 2-7 the entire trip. Skies: Skies were clear blue all day. Our agreed upon objective for this trip was to give Ben some skills in both fish location and lure presentation so he could take these skills and do better than ever before on his home lake (Granger). With this in mind I started off by completely explaining the concept of sonar and sonar interpretation. We combined this with terrain association so he could draw parallels between what he saw on the shore and what he saw on sonar. We next sought out white bass so he could observe these fish on sonar responding to slabs directly beneath the boat. While on these fish, Ben learned to cast a spinning rod and to work a slab spoon effectively with that rod. We hung around Areas 103 and 108, as well at Area 418 and found very sluggish fish, as you’d expect with high pressure nearly completely built in and the winds calming down. Regardless, we were able to pick up 8 average white bass – enough for Ben to get the hang of keeping the lure on sonar and working it effectively both in front of bottom-hugging fish and suspended fish. Next, we took up the task of largemouth bass fishing. We started with a very basic jigworm setup and hit a number of points including Areas 420, 421, 422, 246 to 423, and Areas 424 to 425. Every single one of this areas produced fish for us. At first the jigging technique I instructed Ben in was awkward, but, as I gave him additional pointers to help him refine his technique, he got more fluid and natural in his presentation, and began catching fish, including the first largemouth bass of his life, followed by several more. Jeff, a bit more experienced with spinning gear, did very well. By trip’s end, with only Ben and Jeff fishing, the two put 17 largemouth in the boat and had several more missed strikes and hooked fish get off at boatside when their jumps and headshakes went uncontrolled, including, unfortunately, the largest fish we raised all day — one I estimated at around 4 pounds … at least we got to see it!! Most fish were smallish, but the sheer number of them gave ample opportunity for someone new to this to feel the strike, to set the hook, to play the fish, etc. Ben was excited at the end of the trip to put these new lessons learned to work for him, and I was excited for him. An enthusiastic learner is a real motivator for me, and Ben was just that … eager and appreciative. I fished today with returning guests Jason and Melissa G., and their friends, Dian R. and Mike H., all from the Dallas area. Weather was a big concern on this trip as the rain and thunderstorms that moved in around 5am the day before didn’t break up and move out until around 10am today. For this reason, we did a “split trip” meaning we fished what remained of the morning bite after it was safe to get on the water, and then met again in the evening right at 6p, and fished the evening bite leaving the bright, windless mid-day hours alone. 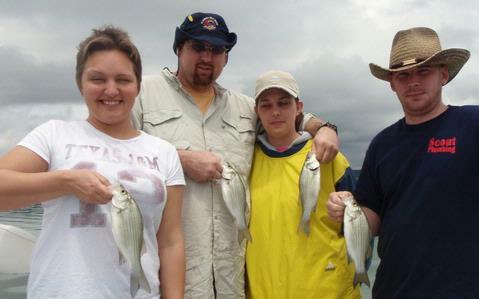 Dian, Jason, Melissa and Mike with a sample of their morning catch. 149 fish were caught this day. Air Temp: 61F at trip’s start (AM); 74F at trip’s start (PM). Wind: Winds were NE at 3-4 after the storms cleared but went flat calm by 11:30; afternoon winds were just puffing from the SE. Skies: Skies were 100% in the morning, with afternoon clearing. 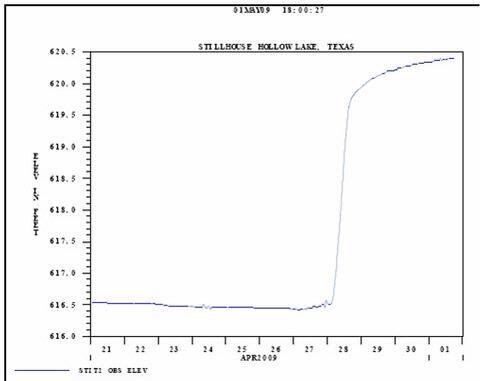 Environmental Note: We experienced 2.75 inches of rainfall from 5a on 17 April through 10a on 18 April. When all was said and done today, we wound up taking fish from three general areas. In the morning we found fish at between Area 143 and 54 in 24 to 25 feet of water, and again at Area 314 in 26-30 feet of water. At both areas we found fish both on bottom and suspended. The suspended fish were found from 12′ deep to the bottom. Just about any retrieve we tried took fish when they were spread through the water column including jigging, a lift-drop retrieve, and a smoking retrieve. Occasional, brief surface activity could be seen, but only 2-3 fish or so would be involved. Once the wind died and the sun brightened through the clouds, this bite was over. In the evening we returned to between Area 143 and 54 right around 6:20 and did well there for about 30 minutes, then things went quiet. By this time the sun was getting low and some occasional, brief topwater feeding, again only involving several fish at a time, broke out, as did some feeding by terns. This was enough to signal to us where the fish were, and we were able to get on top of them and stay on them until dark, at and around Area 419. Dian and I caught fish consistently using a vertical presentation, and Jayson, Mike and Melissa used a sub-surface retrieve to target the topwater action. Today’s catch consisted of mainly white bass right around the 11 3/4 inch mark, with 3 crappie, 3 drum, and a dozen or more largemouth on both sides of the legal 14″ mark. Fished a half-day morning trip with my little buddy Jaylen today. The threadfin shad spawn has begun making for some good shallow water action. Air Temp: 59F at trip’s start. Wind: Winds were SE at 7-9 at sunrise (obscured) and increased to SE at 13-16 by trip’s end. Skies: Skies were 100% overcast the entire trip. Environmental Note: We witnessed abundant threadfin shad spawning in the shallows today. I was a bit concerned about today’s adventure given an easterly component to the wind, but the rising water temperature trumped all and put the threadfin shad to the shoreline spawning. We looked closely for the right kind of bird activity to point the way to fish, and several accommodating blue herons, egrets, and ospreys helped us out. After unsuccessfully flatline trolling a bit, we witnessed this bird activity at Area 426 and acted on it. From 7:30 to 10:00a we stayed on the fish, all in less than 9 feet of water, and many within feet of the shoreline. We encountered a mix of black bass and white bass in about a 2 to 5 ratio. Of the blacks we caught, half were legal. I used a bladebait and Jaylen used a Bomber, and we did well on both. By the time the action here died down, we’d boated 49 fish including the two largemouth shown above. After this I poked around in deep water but found little. By ll:30a, I gave Area 418 and vicinity a try with the slab and came up with 3 short crappie and moved on. Finally, Area 108 showed some signs of life tight to the bottom as I motored over with sonar on. I looped back after buoying the best of what I saw and had very active white bass respond to our smoking retrieves in 25-27 feet of water. Over the next 90 minutes the two of us put an additional 51 fish in the boat. These were all white bass and all right at the 11 to 11 1/2 inch mark. These fish were spawned out and very healthy with plump bellies. When the action died to the point where the fish would no longer respond to a smoking retrieve, we left them alone and headed for lunch. 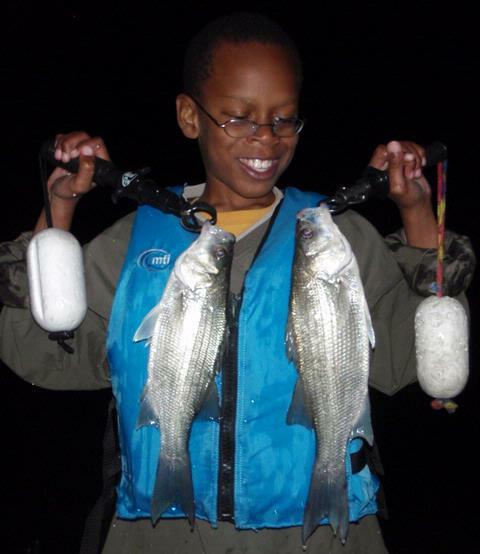 Fished a 1/2 day evening “Kids Fish, Too!” trip with Jaylen G. of Killeen this evening. Jaylen is a very bright, studious, articulate 4th Grader and he can work a mean slab spoon, too!! JAYLEN WITH THE BEST TWO WHITES OF THE 79 WE CAUGHT. Air Temp: 69F at trip’s start. Wind: Winds were tapering off from the WNW at about 14 mph down to 3 past sunset. Skies: Skies were fair with scattered high clouds. Environmental Note: Saw the first 2 flocks of cowbirds for the season traveling the lake this evening, and this coincided with the first observation I’ve made of sustained topwater white bass feeding. Fishing was easy tonight … we went to two locations and caught fish at both of them without much fanfare at all. Our first stop came to the SE of Area 410 around 5:15 after watching sonar and not fishing several areas due to a lack of fish, bait, or both. The wind was blowing into this breakline and bottom-hugging fish were present on the feature. A straight-forward slabbing technique netted us 8 white bass and a short largemouth over a 70 minute span. We left here after that light action tapered off, and I searched a good 3/8 of a mile of river channel without seeing much at all on sonar. By 7:00p I wanted to be up shallower, and so headed over and checked out Area 418 and downwind to the SE of it by ~50 yards. As I motored in, sonar just lit up with fish littering the bottom and I knew this was going to be good. I encouraged Jaylen to really concentrate on doing all the basics right so we didn’t start catching fish and then break our momentum with a tangle, a lure caught in clothing, etc., etc. He really did very well and nearly matched me fish for fish. We caught exactly 70 fish from this general area in an hour’s time. We started in 20 feet with straight vertical jigging, then drifted back into 16 feet, still catching them vertical jigging, and adding a lift-drop technique with a slab to Jaylen’s repertoire. I then put on a blade bait while he was doing well on the lift-dropped slab. When Jaylen wanted to experiment with a bladebait, I went with topwater and caught the first topwater whites of the year from Stillhouse (#2 Polished Chicken Rig). Once sunset was past and it got dark, the only active fish were the ones just 7-8 feet down from the surface. I used a subsurface bladebait to milk the final 5 fish out of the area. By 8:10p, that was all she wrote. 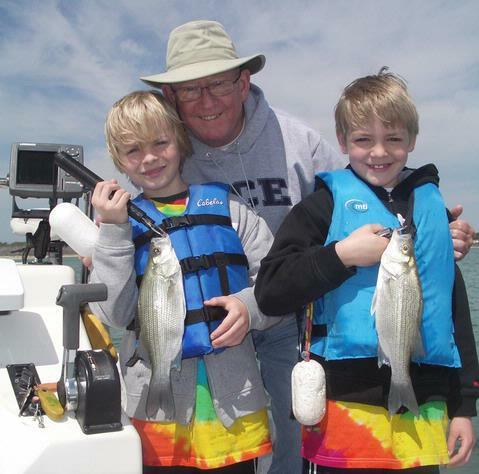 Fished a 1/2 day morning “Kids Fish, Too!” trip with grandpa Keith L. of Georgetown, TX, and his 8 and 9 year old grandsons, Andrew B. and Luke B. of Copley, Ohio. The boys were down visiting during their Spring Break. On this day, we enjoyed near 70 degree temps at sunrise, and the boys were glad to point out that it was snowing back home!! Air Temp: 69F at trip’s start warming to 84F in the afternoon. Wind: Winds were just right — from the SW at about 12 mph. Skies: Skies were overcast and grey. I had a good feeling about this morning’s trip as it was balmy overnight, it was warm and humid at the start of the trip, and a front was due in later in the day with winds due to be taking a NW turn and getting pretty hard. The boys were enthusiastic and attentive which I was pleased to see. With the water temps still in the low 60’s, we’re still on a pretty technically demanding slab bite, but the boys were able to catch on very quickly to the instruction I was giving them about keeping their slabs where the fish were. We launched out and I kept a sharp eye out for birds. We immediately saw 2 osprey working and observed each catch a fish. Suspecting small, schooled white bass near the surface, I went to investigate, but found the birds were picking off large gizzard shad. We settled in and fished an 80 yard swath extending to the NNW of Area 143. I originally got on this area based on some definite but scant sonar returns showing fish in and around this feature. As we began working our slabs, the action began, then increased, then peaked, then fell, then went flat, all over a 2 hour span. It is great to have kids on board and ride that entire morning-feed bell curve like that. We put 43 fish in the boat during the feed and then things quieted down. During the feed we caught fish with both a standard jigging approach and via smoking for doubles and triples at the peak of the bite when fish were chasing hooked schoolmates. We also caught fish using a lift-drop retrieve on cast spoons. 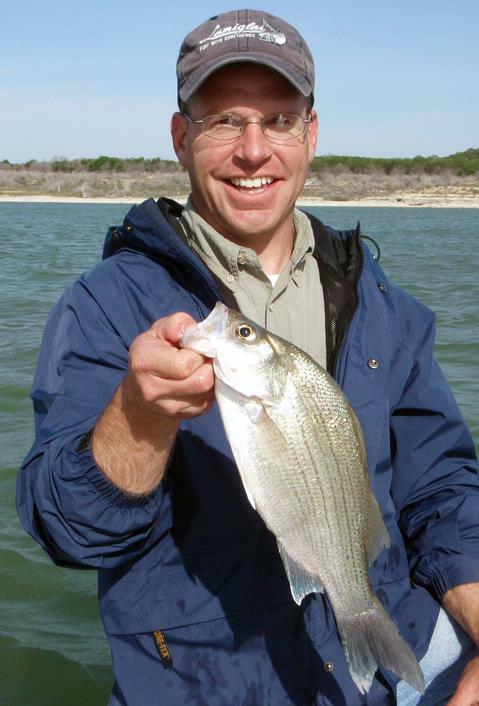 Occasionally, a single white bass or at most 2-3 fish were seen chasing single shad on the surface. We combed the area with downriggers after the bite died and added 2 more fish to our tally on White Willow Spoons and then left this area altogether after subsequent passes failed to produce. Our count stood at 45 fish and it was now about 10:30a. I told the boys I thought we could get to 50 if they were up for it. They gave me the thumbs up and so we then pursued 5 additional fish with crankbaits. We locked onto 2 largemouth and a crappie at Area 888 to Area 405, and lost a real nice largemouth here, too. It’s now 11:10 and we need 2 more fish. We head down to Area 110, and no sooner get our baits in the water than Luke comes up with #49, a white bass, with plenty of other fish showing on sonar. Two more passes yield nothing and the school is gone. We turn parallel to shore and head to the NE of Area 110 — the starboard rod begins to dig in to bottom, then the port side rod does the same — Andrew thinks he’s got one on so we all look but see it’s just the crank rubbing bottom. Then it happened — Luke’s rod loaded and the fish was on. He’d caught the last 3 fish and decided to give the honors to his big brother. Andrew didn’t take the privilege lightly and did a fine job bringing #50 to net — yet another foot-long white bass going right at 3/4 pounds. 50 fish on the nose and home we went! !